Success guaranteed with free-motion sewing and quilting: Thanks to BSR functionality, the BERNINA 830 offers high precision at any sewing speed, with the BERNINA Stitch Regulator enabling stitches of the exact same length in straight stitch or zigzag. With the BERNINA 830, it’s easy to combine stitches and adapt embroidery designs: just click on the desired design on the 830’s large color touchscreen with the touchpen, drag it over to the second design, and you’re done. This intuitive handling gives you the greatest possible freedom when combining different designs – especially advantageous when embroidering with the BERNINA 830. The BERNINA 830’s jumbo bobbin offers 40 percent more thread capacity than the bobbins of other sewing-machine models. With this additional thread supply, the bobbin requires changing far less often, leaving you free to concentrate fully on your creative endeavors. Of course the BERNINA 830’s lower-thread indicator shows how much thread remains on the bobbin, and when the next change is due. And changing the bobbin is also child’s play with the 830: once you’ve opened the hinged cover, a simple press of the finger is all that’s needed to remove the bobbin and insert a new one in its place. Another innovative feature of the BERNINA 830 is the drag-and-drop function, which lets you position the embroidery design precisely and with consummate ease. Simply select the design with the touchpen, drag to the right place, and drop – and you’re done. Through this intuitive operation, the BERNINA 830 embroidery machine allows you the greatest possible creative freedom and reduces effort to a minimum, leaving your mind free for creative design. Especially helpful is the BERNINA 830’s built-in embroidery tutorial, which explains all the important functions on the touchscreen. Endless-embroidery designs are probably among the most demanding embroidery projects there are. The BERNINA 830 embroidery machine offers numerous functions that make endless embroidery easier, masterfully handling every challenge. Automatic size adjustment to the hoop as well as the use of reference points and placement aids offer maximum precision, so that even tricky designs placing the highest demands on the machine come out perfect every time. In addition, the BERNINA 830 embroidery machine offers a far larger embroidery area than comparable machines, thereby enabling successful embroidering even with extra-large embroidery projects. 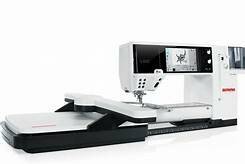 BERNINA 830 users don’t need a PC connection when it comes to embroidering, since 150 designs and ten fonts as well as the embroidery module itself are already included as standard. Thanks to the ArtLink Embroidery Software or the upgraded, optionally available BERNINA Embroidery Software V6, your creativity will now know no bounds. As an embroidery machine, the BERNINA 830 is second to none – as witnessed not only by its breathtaking embroidery speed of up to 1,000 stitches a minute, but also by its wide range of embroidery motifs and functions which can be accessed at the touch of a finger via the 830’s large color touchscreen: horizontal and vertical combining of embroidery designs, rotating, mirroring and resizing are all accomplished in a flash.